As I work on this family of Philip and Margaret McMurray Brown, I find that I need to be very careful because I am discovering that the information from cousins is not necessarily correct. This is not a criticism but more a cautionary statement. Just be careful with the information that I give and make sure you double-check my results. I am always willing to revisit the facts and make changes. The list of Philip and Margaret’s children had them as follows, beginning with: William b. 1841, Frances b. 1843, Alice Marie (Elsa Maria maybe) 1845, Elizabeth 1845 but there is also another baptism of an Elizabeth in 1861 a daughter of Philip & Margaret Brown. I have notes from my visit to Kingston in 2014 to the Anglican Diocese that have an Elizabeth Brown born 28 April 1861 to Philip and Margaret Brown, unfortunately, I did not get a copy of this source. (#19 rS2). So I have moved ahead to Thomas Henry Brown and we will see what happens as I dig further. Thomas Henry Brown went by Henry or Henery sometimes. He was born the 7th of December 1846 in Rawdon Twp. and was baptized on the 8th of January 1847 at the Saint Thomas Anglican Church in Belleville. Thomas, born 27 December last, son of Phillip Brown and Margaret his wife, was baptized this 28th day of January 1847 by me, John Grier, Rector. Witnesses: Thomas Brown, Philip Brown for father and Mrs. P. Brown for mother. He was with his parents in the 1861, 1871 Census in Rawdon, Hastings Co. using the name Henry in the 1861 census and Thomas in the 1871. See the post about Philip and Margaret McMurray Brown’s descendants dated 5 June, 2015. In the 1881 Canadian census Thomas Henry Brown is with his own family. We see that his wife is going by the name of Hester in this census. Source: 1881 Canadian Census, Rawdon Twp., Hastings Co., Ontario, Dist. #122, CDiv 3, page 4. Thomas married Hester Anne Downey about 1874. I cannot find a marriage record. 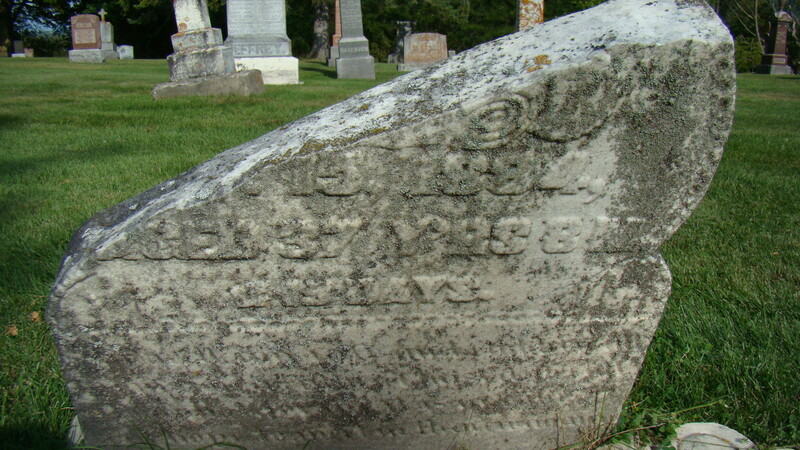 She was born about 1856 in Hastings County. I have seen her name as Esther Anne or even Hatie Anne and her last name as Deary or Dearing. Family trees list her father as Andrew and mother as Martha Matilda Downey. See Family Search genealogies for more information. She may have been the sister of James Downey who married her husband Thomas’ sister Matilda Jane. Hester appears on the marriage record as a witness using Hester Anne Downey. This marriage was 9 April 1873. I will post about James and Matilda in a future post. Much to my delight I found Hatie/Hester in the 1891 Hastings North Canadian Census. Source: 1891 Canadian Census, Ontario, District #74 N. Hastings, S. District #4 Rawdon, page 7, enumerated on 12 April, 1891, by John [Larsne]. Thomas and Hester had the following children from the census. 1. Earnest/Ernest Arthur Brown b. 10, January, 1875. He lived in Harold, Ontario. line 35, 40/41, Brown Ernest, M, Head, M, 10 January, 1875, born Ontario. 26, all born Ontario, all Irish, farmer, Brown, Nancy F, wife M, 22 Febry 1875, 26, Brown Annie, F, daughter, 11 Febry, 1899, 2, Brown, Alice F, Sister, S, 12 April 1882, 19, Brown, Harry, M, Brother, S, 2 Aug, 1877, 23, laborer farm, Brown William, M, Brother, S, 14 Aug. 1879, 21, laborer mill. Source: 1901 Canadian Census, Rawdon, #71 North Hastings, Ontario, page 4, PDiv 4, enumerated April 11 and 12, 1901, by Edmund Caverly. Ernest married Nancy McMaster on 25, May 1897 in Northumberland & Durham. Marriage of Ernest Brown, age 22, born about 1875 in Rawdon, marriage 25, May 1897 in Northumberland & Durham, father Thomas Henery Brown, mother Hester Ann Dancey Brown, spouse Nancy McMaster, age 23, born about 1874 in Rawdon, father William McMartin and mother Margaret Lawder. 2. Thomas Harry Brown born 2 August, 1877, in Hastings Co., Ontario. Looks like he was called Harry but it is not clear if that is a nick name or not. 3. William James Brown born 14 August 1879, Hastings Co., Ontario. He married Jennie Miller on 22 April 1903 in Nipissing District. Marriage of William James Brown, age 23, born about 1880, in Stirling, marriage date 22 April, 1903 in Nipissing District, father Thomas Henry Brown, mother Hester Ann Downey Brown, Spouse Jennie Miller age 32, born about 1871 in Renfrew, father William Miller and mother Catherine Hamilton. Source: Ontario, Canada, Marriages 1801-1922, William Brown to Jennie Miller, 22 April, 1903, Nipissing District and County #013458. 4. Alice Brown born 12, April 1882 in Hastings Co., Ontario. She married an Alex Fleming on 21 May 1901 in Hastings. Marriage of Alice Brown, age 18, born about 1883 in Rawdon, married 21 May 1901, Hastings county, father Henry Brown, mother Hester Dearing, Spouse Alex Fleming age 22, born about 1879, in Huntingdon, father Robert Fleming, mother Samantha Reid. Source: Ontario, Canada Marriages, 1801-1928, Alice Brown to Alex Fleming, 21 May 1901, Hastings Co., page 625. I have found Hester’s death in Hastings but not her place of burial. #16 Hesther A. Brown, died March 24, 1896 Female, 41 years, farmer’s wife, born Huntingdon, Ontario, died of Consumption 2 years, W. A. Sargent MD, witness Ernest Brown of Harold, registered May 12th 1896, Episcopalian, Thoms. C. McConnell. 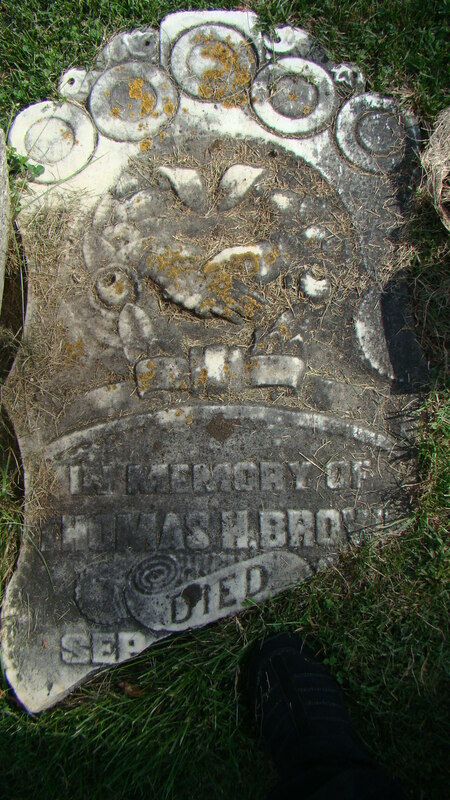 There is a broken and old tombstone in Stirling Cemetery with the name Thomas H. Brown and the date of death as September 15, 1884. It reads 37 years, 8 mos. and 19 days. See Find A Grave for more information. He is listed in the Stirling Cemetery book #167. This stone is to the right of the large stone that has his father’s name inscribed on it. There is certainly more research to do on this couple of Thomas and Hester. All the above needs to be verified, it has been difficult to find information on this family; hopefully one can dig further from this point and do census searches on the children. Time to move on to other children. This entry was posted in Alice Brown, Downey surname, Ernest Arthur Brown, Fleming surname, Hastings Co., Margaret McMurray & Family, McMaster surname, Miller surname, Northumberland County, Ontario, Philip Brown 1817 to 1895, Rawdon Twp., Stirling Cemetery, Thomas Harry Brown, Thomas Henry Brown & Hester Ann Downey Family, William James Brown on July 6, 2015 by BJ MacDonald.